<h2>Police turn to hackathons as crime fighting goes digital</h2><br /><p>‘We are trying to get them to think like a few geeks in a garage,’ said Seán Gaines from Vicomtech, an applied research centre for visual interaction and communication technologies in San Sebastián, Spain.</p> <p>The idea is to show police how it is possible to acquire data, process it, get knowledge from it and visualise it all in one day.</p> <p>Law enforcement agencies often use big data to aid investigations, which can range from the content of a personal computer, to intercepted voice conversations or YouTube videos. Yet, even a 1 terabyte hard drive, for example, can take weeks or months to process as several different file types, some possibly encrypted, would need to be analysed.</p> <p> <div class="quote-view quotesBlock quote_horizontal"> <div class="quotesTop"><img src="https://horizon-magazine.eu/sites/all/themes/horizon/images/quotes_top.png" alt="" title="" /></div> <p>‘We are trying to get them to think like a few geeks in a garage.’</p> <blockquote><p>Seán Gaines, Vicomtech, Spain</p></blockquote> <div class="quotesBottom"><img src="https://horizon-magazine.eu/sites/all/themes/horizon/images/quotes_bottom.png" alt="" title="" /></div> </div> </p> <p>In addition, for recovered information to be usable as proof in court, it needs to be examined in a controlled and traceable way.</p> <p>‘If we can reduce the time it takes to gather intelligence, for example, it could prevent an incident,’ said Gaines. 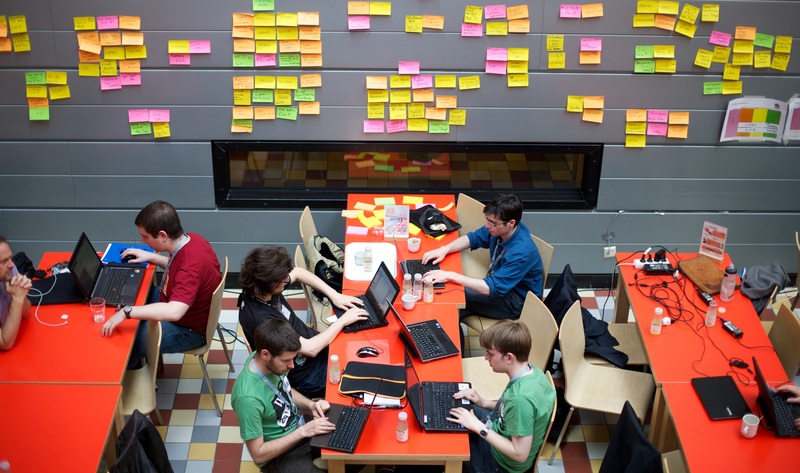 ‘Those hours are critical.’</p> <p>The first hackathon, which took place in Soesterberg, The Netherlands, in May with over 80 participants, was a success. ‘The idea is to quickly produce a tool that functions rather than waiting for something perfect,’ explained Gaines, who is working on an EU-funded project known as ASGARD.</p> <p>Law enforcement agents will work together with research organisations and industry so that they learn how to collaborate,&nbsp;<span style="font-size: 13.008px;">as specialised technology can be hard to get a hold of or customise and can be very expensive.</span></p> <p>The next hackathon will take place in Paris in November, and the project is planning four more but hasn't decided on the locations yet. The researchers hope to create a community that will continue after the project has finished.</p> <p><strong style="font-size: 13.008px;">Critical</strong></p> <p>As the internet evolves, police will have more information at their disposal as connected gadgets like fitness trackers and smartwatches become more prevalent.</p> <p>Professor&nbsp;Peter Druschel from the Max Planck Institute for Software Systems in Saarbrücken, Germany, explained:&nbsp;‘Just by living and carrying these devices, information about movements and social interactions become visible.’</p> <p><a href="http://bit.ly/newsalertsignup" target="_blank" rel="noopener noreferrer"><img src="https://horizon-magazine.eu/sites/default/files/news-alert-final.jpg" width="983" height="222" /></a></p> <p>He is looking at how to balance the needs of individuals who legitimately need privacy, like political dissidents and whistleblowers, with those of law enforcement agencies and service providers who require a certain degree of accountability as part of the IMPACT project, funded by the EU's European Research Council. Currently, he and his team are trying to understand how people feel about privacy, with a view to developing software that could make them safer online.</p> <p>Existing technology works on the basis of a trusted infrastructure with well-defined policies. However, in today’s internet, identities can be fluid and people often use global third-party platforms.&nbsp;</p> <p>One of the systems the project is developing will be able to identify internet users based on certain criteria while allowing them to retain some degree of anonymity. An online community for teenagers, for example, wouldn’t need to know people’s real names, but would want to know if they are actually adolescents by verifying their age from a trusted authority.</p> <p>Each person would also have a unique signature to prevent them from signing up with several pseudonyms. ‘Currently, a provider can block someone but they can’t prevent them from signing up the next day with a new identity,’ said Prof. Druschel. ‘It’s a massive problem.’</p> <p class="selectionShareable"><em>If you liked this article, please consider sharing it on social media.</em><br /> <div class="moreInfoBlock"> <h3>Access to phone data</h3> <p>The EU’s 2006 <a href="http://eur-lex.europa.eu/LexUriServ/LexUriServ.do?uri=CELEX:32006L0024:en:HTML" target="_blank">Data Retention Directive</a> requires Member States to keep mobile phone records for between six months and two years.</p> <p>Under the Directive, phone companies have to make the data available to police when requested to help them investigate and prosecute serious crimes.</p> <p>The data should be detailed enough to allow detectives to trace the source of a call, know the date and time, the device and the location of the person being called.</p> </div> </p> <br /> <img src=”http://www.google-analytics.com/collect?v=1&tid=UA-40077089-1&cid=police-turn-to-hackathons-as-crime-fighting-goes-digital&t=event&ec=republish&ea=read&el=police-turn-to-hackathons-as-crime-fighting-goes-digital&cs=republish&cm=republish&cn=republish&cm1=1" /> This post <a href="https://horizon-magazine.eu/article/police-turn-hackathons-crime-fighting-goes-digital.html">Police turn to hackathons as crime fighting goes digital</a> was originally published on <a href="https://horizon-magazine.eu/">Horizon: the EU Research &amp; Innovation magazine | European Commission</a>. ‘We are trying to get them to think like a few geeks in a garage,’ said Seán Gaines from Vicomtech, an applied research centre for visual interaction and communication technologies in San Sebastián, Spain. The idea is to show police how it is possible to acquire data, process it, get knowledge from it and visualise it all in one day. Law enforcement agencies often use big data to aid investigations, which can range from the content of a personal computer, to intercepted voice conversations or YouTube videos. Yet, even a 1 terabyte hard drive, for example, can take weeks or months to process as several different file types, some possibly encrypted, would need to be analysed. In addition, for recovered information to be usable as proof in court, it needs to be examined in a controlled and traceable way. The first hackathon, which took place in Soesterberg, The Netherlands, in May with over 80 participants, was a success. ‘The idea is to quickly produce a tool that functions rather than waiting for something perfect,’ explained Gaines, who is working on an EU-funded project known as ASGARD. Law enforcement agents will work together with research organisations and industry so that they learn how to collaborate, as specialised technology can be hard to get a hold of or customise and can be very expensive. The next hackathon will take place in Paris in November, and the project is planning four more but hasn't decided on the locations yet. The researchers hope to create a community that will continue after the project has finished. As the internet evolves, police will have more information at their disposal as connected gadgets like fitness trackers and smartwatches become more prevalent. He is looking at how to balance the needs of individuals who legitimately need privacy, like political dissidents and whistleblowers, with those of law enforcement agencies and service providers who require a certain degree of accountability as part of the IMPACT project, funded by the EU's European Research Council. Currently, he and his team are trying to understand how people feel about privacy, with a view to developing software that could make them safer online. Existing technology works on the basis of a trusted infrastructure with well-defined policies. However, in today’s internet, identities can be fluid and people often use global third-party platforms. One of the systems the project is developing will be able to identify internet users based on certain criteria while allowing them to retain some degree of anonymity. An online community for teenagers, for example, wouldn’t need to know people’s real names, but would want to know if they are actually adolescents by verifying their age from a trusted authority. The EU’s 2006 Data Retention Directive requires Member States to keep mobile phone records for between six months and two years. Under the Directive, phone companies have to make the data available to police when requested to help them investigate and prosecute serious crimes. The data should be detailed enough to allow detectives to trace the source of a call, know the date and time, the device and the location of the person being called.